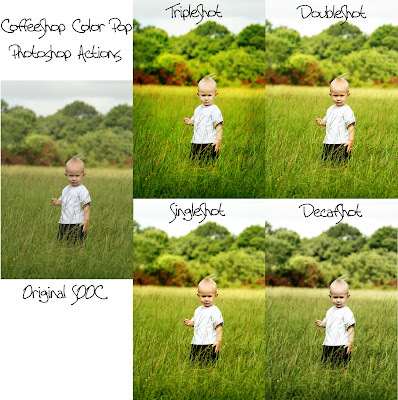 The CoffeeShop Blog: Photoshop Color Pop tutorial. This tutorial was written for Photoshop, so all of the steps will not work in Photoshop Elements. Free Coffee Shop color pop actions will be posted here in the next few days, including this one. Click on the photo to see the larger pic. Then click on "All Sizes" on top and then click on large to see a large copy. Here is one way I do color pop. 1. Contrast layer: Curves layer to adjust color (use black eyedropper to click on black on image, use white to click on white in image, if looks strange hold down alt key and press reset and start over) and then adjust contrast with minor S curve. 2. Lighten layer: Click on background, then ctrl-J to copy it. Put that layer in screen and lower opacity to taste. Mask out anything else you want darker. 3. 50% gray layer for lightening skin: Add new blank layer, fill with 50% gray and put it in overlay blending mode, then use a soft white brush with lower opacity and brush over skin to lighten. If you mess up just brush over areas you want back with a soft black brush. You can then lower the opacity of this layer if needed to taste. This is not always necessary, but sometimes I want a slightly lighter desaturated skintone. 4. Hue/Saturation layer: Add saturation (40 - 50% or to taste), put layer in color, then fill layer mask with black. Use a lower opacity white brush and paint in background and anything you want really colorful. You can also adjust the opacity of this layer if needed. 5. Selective color layer: I take away cyan and add yellow to red, then add extra yellow to yellow, add more black to black. Play around with this, it is to taste! 6. Burn edges layer: Click on background, ctrl-J for copy of background. Use burn tool set at low opacity and burn edges to taste. 7. Sharpen layer: Click on background, ctrl-J for copy, move above lighten layer. Use high pass filter (adjust setting where you see light outline of what you want sharpened), then put that layer in overlay, and adjust opacity to taste. Or just use a unsharp mask on this copied background layer to taste. 8. Top layer to custom set the entire effect: Make a new blank layer on the top. Hold down alt key and go to Layer<Merge Visible. This should merge all of your layers into the top layer without affecting any of your other layers. Make visible this layer and your background, turning off all of the other layers (as seen in the picture). Then adjust opacity of the top merged layer to taste. Then flatten and save! I will make a free action for this color pop technique which I will post here shortly. Sorry about the poor quality capture, I was just playing around with a substandard SOOC (straight out of camera) photo today and found a color pop technique I like, and did not have time to work on a decent shot! I wonder...I am new to using PSE for more than sorting pictures and have tried to research this-my girls are African American and so their "pop" is different, sometimes they get really grainy or grey looking and wonder how this action can work for me? I also take lots of pictures of colored people, ranging from chinese to african american, with indian in between...Do you have any tips on color pop for these kind of pics? Amanda and Sandra, I would love to play at this and figure out some techniques. Would it be possible for either of you to send me a few 300 dpi pictures of people that don't look like they lived in a cave for a year (my unfortunate family!) for me to play with? Just send them to coffeephotolove@yahoo.com and I will try to give you some ideas! Did you ever come up with anything for african american skin colors? The issue I think is that we come in such a variety of shades, some with lots of red, or yellow, or blue or combination tones that we get weird results with some of the actions. I was looking to see if anyone had addressed this issue and ended up here....give a shout and let us know. Many thanks for all of your kindness in sharing your expertise.